Order in next 13 hours and 54 minutes for despatch today. 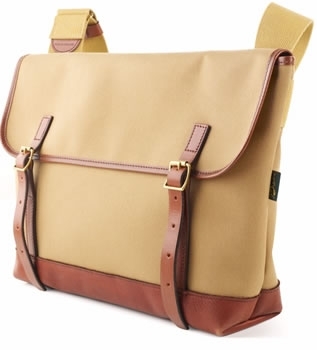 MacLaren Canvas Shoulder Bag by Brady. Each of the bags in the Brady Discovery range is made from khaki Italian double-laminated cotton canvas, with bridle leather trim and quality solid brass fittings. The MacLaren shoulder bag by Brady is a despatch style bag with a reinforced leather base panel. The flap fastens with leather straps and brass buckles. It has a zipped pocket inside and a wide webbing shoulder strap. It measures 12" x 4" x 15" (29cm x 10cm x 39cm).